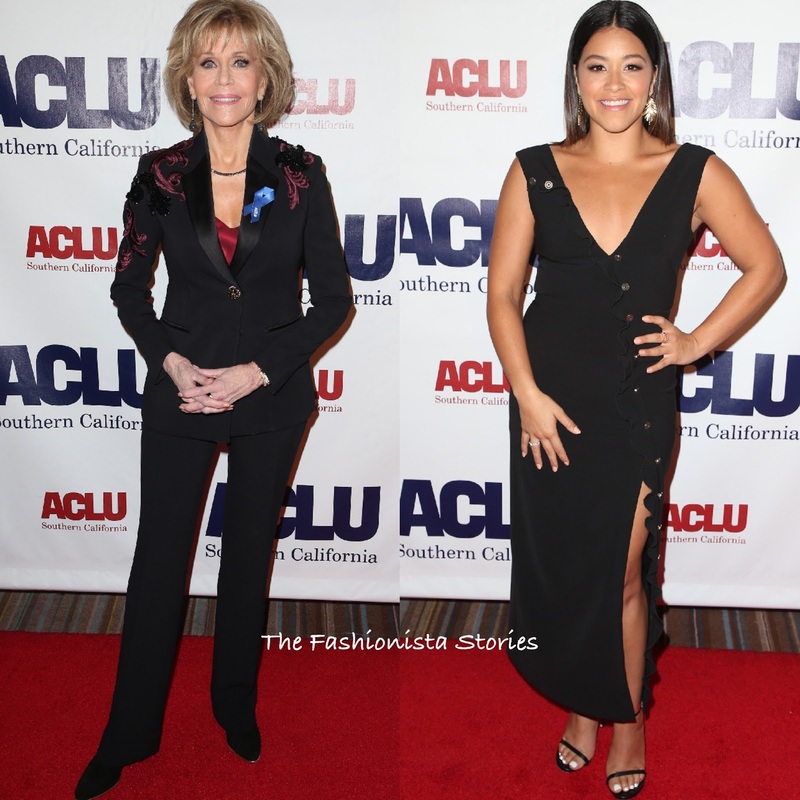 On Sunday(December 3rd) Andra Day, Viola Davis, Jane Fonda and Gina Rodriguez attended the ACLU SoCal's Annual Bill of Rights Dinner at the Beverly Wilshire Four Seasons Hotel in LA. Andra Day was stunningly beautiful in a BLOOD & HONEY FALL 2017 fur panel coat which she wore as a dress and belted the waist. Her beauty look was flawless which topped off her look along with JEAN-MICHEL CAZABAT sandals. Viola Davis was simply beautiful in a black sleeveless fit 'n' flare dress with flirty cutout sides. Adding some sparkly to her look, she accessorized with a glittery clutch, bracelet and black & silver glittery sandals. A complimentary beauty look finished up her look. Jane Fonda stepped out in a VERSACE PRE-FALL 2017 black two-piece suit which featured a beaded embroidered blazer. Styling her suit with a burgundy silk camisole underneath, she finished up with her signature beauty look and black boots. Gina Rodriguez wore the SALONI FALL 2017 'Marley' black sleeveless ankle length dress which featured a v-neckline and a ruffle asymmetrical, split detail. Keeping the styling simple, she finished up with HUEB & DJULA earrings, black sandals and straight off-the-shoulder tresses.